Sewage effluent and treated water are stored in the tanks as part of the water treatment system. 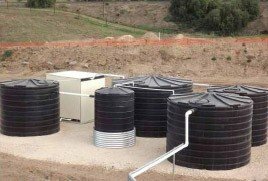 Environmental Water Services specialises in the design, manufacture and construction of sewage treatment plants, ground water treatment systems, potable water treatment operations, oil\water separation units and industrial waste water treatment plants. The tanks are incorporated into the water and sewage treatment system. The tanks used in this project were 46,400 litres in size which were manufactured with 1.2 and 1.5 SG ratings. – EWS places a great deal of importance in its ability deliver to their customers a reliable and cost effective water and sewage treatment plants. These plants have to be delivered on time to their clients satisfaction. Bushman Tanks has demonstrated a solid committment to provide EWS with the tank design, manufactured quality and on time delivery to their water treatment facilities.